I like plastic balloons, polly pockets, cheap cake and spooky couches. 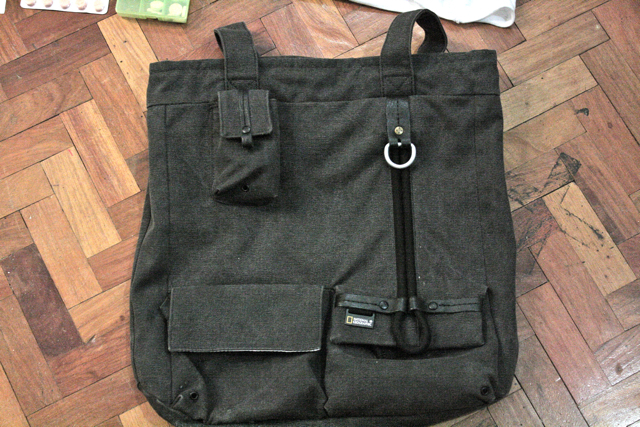 Surprise attack on my bag by Julius. 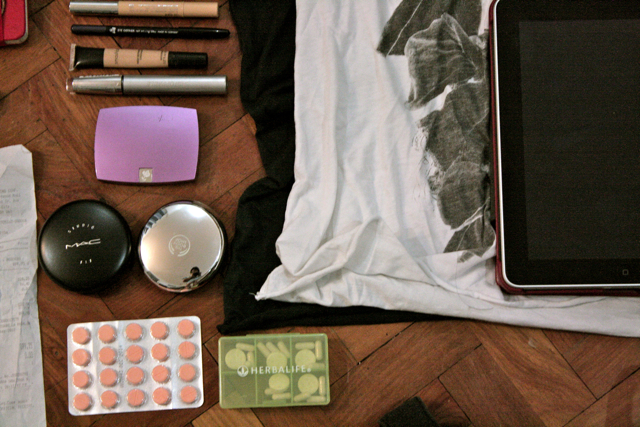 I was on his couch quietly reading on my iPad when he decided to do another version of What’s In Your Bag. I was not prepared, okay… Hahaha! 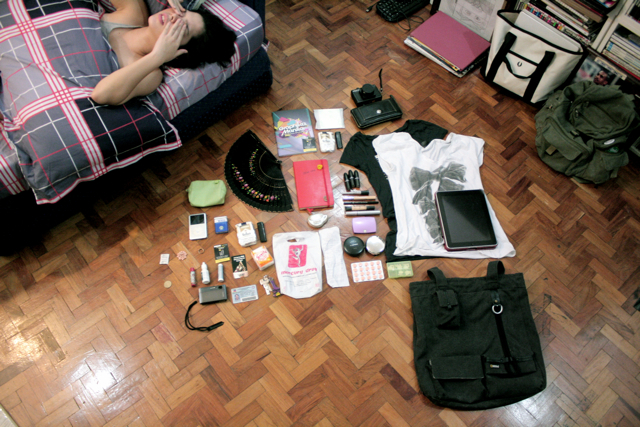 Good thing my bag wasn’t so messy. I didn’t know I was part of the shot haha. Not seen in close-up shots are things found at the upper right corner of this picture. 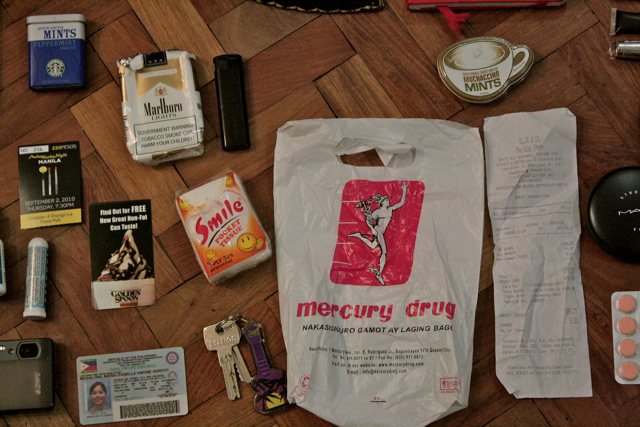 Unused napkin, Holga camera (na wala namang film), Coach wallet that I borrowed from mom. 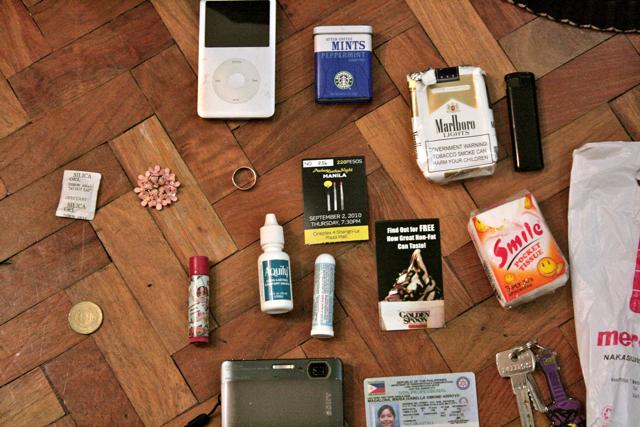 iPod classic (na hindi ko alam kung nasaan ang earphones), after coffee mints, cigarette pack na wala namang laman, lighter, Silica gel from when I bought the bag (haha never noticed), broken ring from F21, stray 5 peso coin, lip balm, fake tears for when my contacts dry up, inhaler bec I came from sipon, Pecha Kucha ticket, free Golden Spoon card from PK, tissue I found sa condo (hehe finders keepers), Mom’s Sony TX5 (na wala namang battery), my driver’s license, keys to the condo. 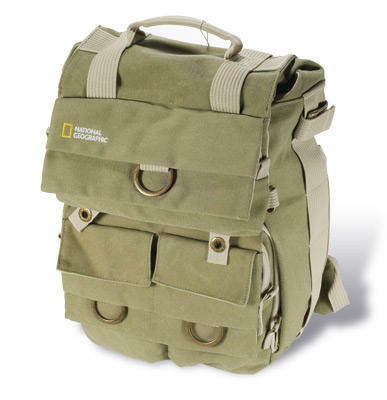 Current bag is from National Geographic bought in Hong Kong. 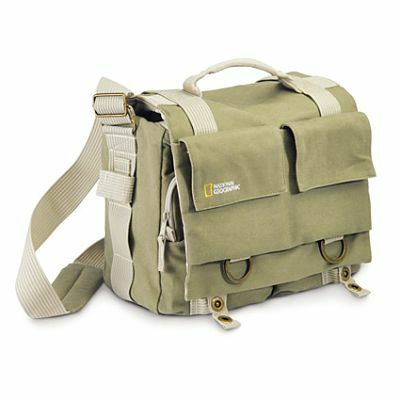 I LOVE NATIONAL GEOGRAPHIC BAGS! 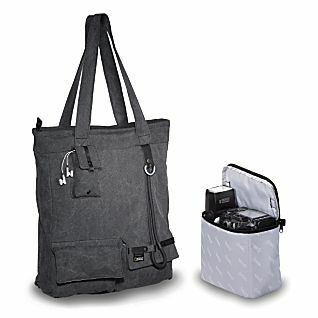 This one comes with a camera bag, perfect for my Canon 1000D! 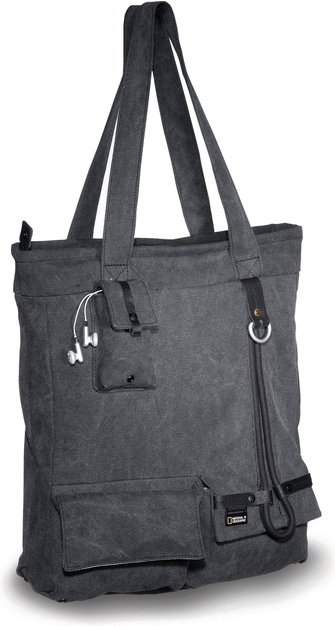 Such a fan of bags with lots of pockets! Look at this one! I think I can see Julius’ reflection in the Body Shop powder. Hehehe #randomlangjustlikeyoustuff Haha! I love the Dear Saab notebook. I should have mine too, syempre Dear Jamie. 😀 I keep on having random thoughts on random moments. Just so I can keep track of them and they won’t slip out of my mind. Love ya! You are way too cute for words without even trying. Just a quick question: Which of the 3 MAC lipsticks would you say you like the most? How do you like Pink Nouvea? I was thinking about buying it but not too sure. Thanks! If you don’t mind, by the way … What is the font of Maxx’s tattoo? v3? 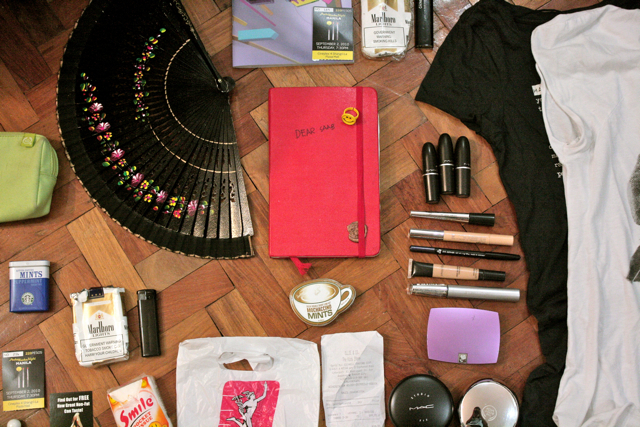 where’s the 2nd version of your “what’s in my bag”? haha! i imagine those things jammed in ur bag! ^^ ansaya kc nkakakonek aq s gniang mga halo-halong kalat s bag… empty packs ng cig, plastic bag ng kng anumang shop, resibo at samu’t-saring mga bagay! love it! btw, kudos to your parents for bringing up a fantastic lady like you! they are the best!